Viruses causing the common cold and flu can affect us in both summer and winter. The average person gets 2 to 3 of these infections a year, and sometimes avoiding colds or flu seems to be an impossible task especially when those around us are coughing and sneezing. Echinaforce is a traditional herbal remedy for colds and flu. It helps the body fight the symptoms of these infections by supporting the immune system, helping to maintain the body’s resistance. 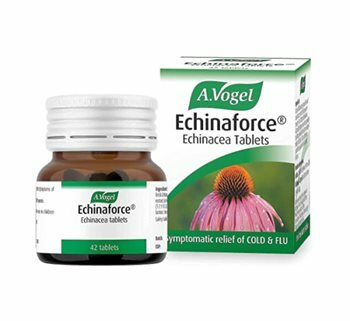 Echinaforce contains extracts of freshly harvested, organically grown Echinacea purpurea herb and root. Plants are picked fresh and used within 24 hours of harvest - this has been shown by research to produce almost 3 times more active substances than the same amount of dried herb*. Which is why, when you need to fight the misery of colds and flu, not all Echinaceas are the same. Extract of Echinacea purpurea herb and root: Lactose, starch and magnesium stearate. One 250g tablet contains 6.2mg Echinaforce concentrate, equivalent to 270mg of whole fresh plant or 60mg of whole dried plant. Adults and the elderly: 2 tablets two to three times daily. Children (6–12 years): 1 tablet twoto three times daily.